Some factual errors about the Camaro project in the story below, but some good Chrysler history in the following story. The all-new Dodge Challenger "is a go!" That's the word from Chrysler Group President and Chief Executive Tom LaSorda, who recently announced plans to bring the Challenger concept to production as a 2008 model. Making the announcement via Webcam from Daytona International Speedway, LaSorda gave longtime Challenger fans the news they had been hoping for since the concept vehicle was unveiled in January at the 2006 Detroit auto show. Some Chrysler officials said at the time of the Detroit showing that bringing the Challenger to production was already a given. But the company waited until just before the recent Daytona Pepsi 400 NASCAR race to make the official announcement. "We haven't seen this kind of spontaneous, passionate response to a car since we unveiled the Dodge Viper concept in 1989," LaSorda said during the announcement. "But it's easy to see what people like about the Dodge Challenger. It's bold, powerful and capable. It's a modern take on one of the most iconic muscle cars, and sets a new standard for pure 'pony car' performance." The new Challenger has the same "long hood, short deck, wide stance and two-door coupe body style that distinguished the iconic Challengers of the 1970s," Chrysler said in a news release accompanying the Daytona announcement. But that's something of an understatement. Those of us who watched the unveiling in Detroit were immediately struck by the similarities to the original Challenger -- so much similar that the new model almost looks like a restored version of the old one. "We drew on the rich heritage of the Dodge Challenger, but with contemporary forms and technologies," Chrysler Group Chief Operating Officer Eric Ridenour said during the Daytona event. "It's not just a re-creation; it's a reinterpretation." The Challenger came to market in fall 1969 as a 1970 model, using the same architecture as the Plymouth Barracuda. But the Challenger was roomier, thanks to a 2-inch-longer wheelbase. It was discontinued after the 1974 model year, but thousands of them live on in the garages and driveways of Mopar collectors. Chrysler notes that the Challenger was originally offered in coupe and convertible models; there was never a four-door sedan version. In the first year, the Challenger was offered in a limited-edition model to meet requirements for SCCA Trans-Am racing. In 1971, a Challenger was the pace car for the Indianapolis 500. New front-end styling was introduced for 1972, featuring a larger "egg-crate" grille. In April 1974, production ceased. Over that five-year run, Chrysler sold about 188,600 Challengers. Onstage at Cobo Hall for the Detroit unveiling, Chrysler Group chief designer Trevor Creed showed off the 425-horsepower Challenger concept to an enthusiastic group of automotive journalists and a few Mopar muscle-car buffs who had been invited to attend the unveiling. "The Dodge Challenger concept propels the pony car into a new era," he said. Chevrolet followed a day later with the introduction of its pony car, the Camaro, with a version of the 400-horsepower V8 engine found in the 2006 Corvette. The Camaro's exterior styling, however, is decidedly less retro than that of the Challenger or even the current Mustang. We had the opportunity to compare the old and new ones almost side by side. As a prelude to the Camaro concept's introduction, Chevy officials rolled out six 1969 Camaros owned by collectors -- including Ed Welburn, General Motors Corp.'s global design director, who drives his yellow Camaro to work every day. GM said that the '69 model was the one its designers used to help them create the concept, but the concept draws more from the future than the past, with some cues from the current Corvette as well as some high-performance aircraft, the company said. To me, it looked like a cross between the current Corvette and the Cadillac CTS sedan. It has a high beltline similar to that of the CTS. As for the Camaro, there is a concession to high gasoline prices. The V8 engine has displacement-on-demand technology that cuts out four of the cylinders during highway cruising to give the vehicle up to 30 mpg. Chrysler has similar technology available for its Hemi engines, and I assume that would also be made available in the Challenger, just as it is in the current Dodge Charger, which has the same underpinnings as the Challenger concept. The decision to bring the Challenger to market next year was fairly easy for Chrysler. The company already has an available chassis for the car. GM, though, has no ready platform for the Camaro unless it uses the rear-drive architecture of the CTS. The automaker is still considering whether to continue development of its so-called Zeta rear-wheel-drive platform that was put on hold last year as GM's financial woes increased. The Zeta platform probably would have to be the basis for a new version of the Camaro. GM said it would need to be able to sell about 150,000 of the Camaro annually to justify bringing the car to market. The Camaro has been out of production since 2002, when it was discontinued because of lagging sales and an aging chassis that needed major redesign to meet new safety standards. MELBOURNE, Australia — It looks as if there will be another Holden Monaro, although not for some time, says General Motors designer Michael Simcoe. But when it comes, it could have a Pontiac GTO or a Chevrolet Camaro for a sibling. Simcoe, in Australia for the VE Commodore launch, is quoted in Melbourne's Age newspaper saying: "There will be another Monaro eventually, but it won't be here in the next six months or year or so. It'll still be a little while." A new Monaro wouldn't be produced by itself, he said. "Clearly, we'd never want to do that," Simcoe told Age. "We'd want to find a sister vehicle to give us some volumes so that you could do the job properly." And that sister vehicle? Well, it could be another Pontiac GTO or, as the rumor mill has it, the next-generation Chevrolet Camaro, or maybe both, off GM's Zeta architecture. Holden spokesman Jason Laird refused to be drawn too much into the issue, saying only that Simcoe's comments are "fairly consistent with our position." He went on to add: "We'd like to do another Monaro, but there is no current program." What this means to you: Keep your eyes Down Under if you are interested in the future of GM's sportier offerings. TULSA, Okla. — Rushing through torrential rain on Interstate 44, the Shelby Mustang GT 500 splashes smoothly through road pools at speed. This extreme 500-horsepower muscle car — the newest factory hot rod from Detroit — weathered that storm with ease and grace. But the GT 500 and other domestic muscle cars may face tougher tests ahead. Although demand for the GT 500 is so high that it has pushed the car's $42,000 base price to $50,000 or more at many dealerships, some industry observers think it could be the last 500-horsepower muscle car to come out of Detroit. With gas prices high and baby-boomer buyers nearing retirement, the sun may be setting on traditional American muscle cars. The genre was born more than 40 years ago and revived in the early '90s with the Dodge Viper, whose V-10 engine now pumps out 520 horsepower. Moreover, as General Motors Corp. and Ford Motor Co. struggle financially, the money to develop these cars may be limited — particularly if the number of potential buyers is dwindling. "I think there is a built-in demographic for these cars now," said Michael Jordan, chief of Automobile magazine's Los Angeles bureau, who wrote a story on muscle cars for the July issue. "But it's totally correct to say this is not a big boom market. I just don't see more of the ... (500-horsepower cars) coming from Detroit." Though no one is predicting the imminent demise of all muscle cars, their slow fade could pose a significant challenge for Detroit. Although the cars primarily appeal to over-50 buyers, they are the Big Three's main "halo" vehicles — attention-grabbers for the entire brand. Without high-profile cars like the GT 500 — which should arrive at dealerships within 60 days — and the Z06 Corvette, the Dodge Viper and Charger SRT-8, "the domestics are left with nothing in the way of halo vehicles," said Wes Brown, an analyst at industry consultant Iceology in Los Angeles. "I don't know if we are at the peak or not," he said. "I guess it will be determined by how well these cars are executed." "I don't see the Europeans backing away from selling luxury cars with these massive V-8s and huge horsepower," Brown said. "But that's low volume. "If you want to keep your (sales) volumes high, there could be some resistance to bigger V-8s with high horsepower, particularly if gas stays high." Muscle cars may evolve into smaller, lighter, more economical vehicles that appeal to younger buyers, but they won't fade away altogether, predicted Jim Sanfillippo, executive vice president of industry consultant AMCI Inc. in Bloomfield Hills, Mich.
"Do these cars have a bright future?" Sanfillippo said. "No. But they were always a niche. What you will see in the future is smaller-displacement V-8s, direct injection for power and efficiency, lighter materials. They may be different from today's muscle cars, but they will still be muscle cars." With the arrival of the GT 500, four domestic vehicles now have at least 500 horsepower — including the Corvette Z06, Dodge Viper, and Dodge Ram SRT-10. Sales of those low-volume, ultra-high-performance vehicles are likely to slow first, industry officials say. "I don't know whether we'll see more of these (500-horsepower) cars or not," said legendary Texas racer Carroll Shelby, who built the original GT 350 and GT 500 Mustangs for Ford in the 1960s and worked with the company on the current car. "Five hundred is about as much horsepower as you can put on the ground and use. This horsepower race is kind of stupid." Nonetheless, Shelby, 83, who is one of the oldest living transplant-organ recipients (heart and kidney), expects to work with Ford on another specialty Mustang. "I'm happy with the GT 500," he said from his ranch in East Texas. "It's a really well-thought-out, balanced car." All told, ultra-high-performance cars account for less than 100,000 sales — a tiny portion of the overall new-vehicle market of about 17 million annually. But muscle cars are enormously influential. The GT 500, for example, is on the July cover of Car and Driver, Automobile and Motor Trend magazines. Angus MacKenzie, editor in chief of Motor Trend, believes that high gas prices will affect every segment of the auto industry. But MacKenzie, who completed a 3,500-mile coast-to-coast trip in a GT 500 for a cover story on the car, doesn't think they will kill muscle cars — just reshape them. He and others in the industry expect Chevrolet to build a new Camaro and Dodge to build a new Challenger, providing more opportunities for future muscle cars. In fact, Chrysler Group officials announced Saturday at a NASCAR race in Daytona that the company will build the Challenger. It's expected to arrive at dealerships in about a year. "Americans don't want small cars," MacKenzie said. "They want cars that deliver good mileage." 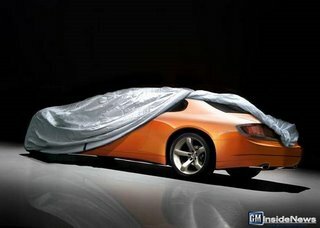 GM Inside News posted a teaser rendering of what they would like to see in a future Pontiac this week. I like it! See the thread (link above) for a full size copy of the image. 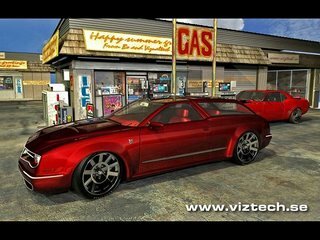 Computer generated design cut Commodore development time in half, and may be used to sell cars too. GLENN BUTLER reports. Welcome to the automotive world of Virtual Reality (VR) Design, Holden style. Holden calls its $6 million design studio "state-of-the-art", and you can see why. Virtual reality visualisations like this allow Holden's designers to get their ideas across without having to bend metal or sculpt clay. Virtual reality has revolutionised the way cars are designed and developed. It has allowed Holden to cut design time down from the VT Commodore's 200 weeks to just 110 weeks on the VE. Martin Wood, the business and technology manager for Holden, says the VR story kicked off back in 1995. "Back then the design department had 10 computers," said Wood. "Most weren't networked and there was no infrastructure in place. Today we have over 150 of the latest CAD workstations, all integrated and connected to the GM design network around the world." This means that designers working on the new VE Commodore – or the Chevrolet Camaro, for example – can be working virtually side-by-side in different countries and on different continents. Changes and modifications to existing designs can be seen almost instantly on the other side of the world. Do you hear the roar already? I do. I'm anticipating the wonderful muscle car sounds that will fill Las Vegas at the Specialty Equipment Market Association show three months from now. The annual show, which is like a religious pilgrimage for some of the most outrageous customized cars to be put before an industry-only crowd, celebrates America's muscle cars this year. The strong-selling Ford Mustang will be there, of course. But so will two cars yet to return to showrooms in modern form: the Dodge Challenger and Chevrolet Camaro. You'll recall they debuted as concept cars at the North American International Auto Show in Detroit in January. 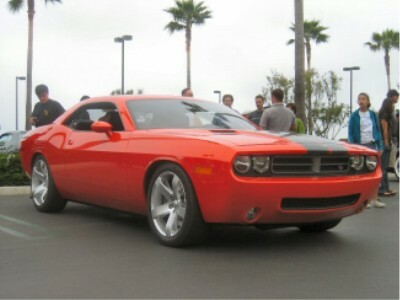 July 1, Dodge announced the Challenger will return as an '08 model. The betting continues that Chevrolet will make a similar announcement before the Oct. 31 start of the SEMA show. Indeed, in an unusual move, all three of the Detroit-area car companies -- Ford Motor Co., General Motors Corp. and DaimlerChrysler's Chrysler Group -- will share the limelight as SEMA's Vehicle Manufacturers of the Show. For 15 of the last 16 years, this designation was rotated among the three large domestic automakers -- one having it one year, followed by another and then the third company. No matter. Sometimes, it's just fun to visit the past and ignore today's realities. For one thing, the muscle car era of the 1960s and '70s is uniquely American, and the American auto industry, facing major global competition, could use some celebrating right now. It's also a good counterbalance to last year's Vehicle Manufacturer of the Show -- Honda, which made history as the first foreign-based car company to hold the title. Honda used the event to herald its new-generation Civic Si. This year's SEMA show marks the 40th anniversary of the California-based SEMA, a 6,500-member organization that represents the interests of aftermarket automotive companies such as wheel manufacturers and engine tuners. In highlighting the three domestic automakers and their storied muscle cars, SEMA is acknowledging the key roles that the Mustang, Camaro and Challenger had in the success of its initial members. Remember, in the early days, SEMA stood for Speed Equipment Manufacturers Association, with an emphasis on speed. "The Mustang, Camaro and Challenger helped bring many of our industry's earliest businesses into being," SEMA President and CEO Christopher J. Kersting notes. "Our roots and our heritage have evolved with the muscle cars of today, so it is fitting that we're celebrating our past while working with (automakers) that are looking to the future." Now that seemingly every car magazine on the planet has taken the Camaro concept for a "test drive," it looks like it's the celebrities' turn. Tonight Show host and hard-core car guy Jay Leno created the latest photo-op for the concept car last Friday, when he took it for a drive in Burbank, California, ending up at the retro-cool Bob's Big Boy diner for its Friday night American Graffiti-style Classic Car Show. Camaro to target the Dodge Magnum? Ever since the Concept Camaro hit the show circuit, people from all over have been submitting their own renderings of different versions of the car. This one comes all the way from Sweden. If it works for Daimler Chrysler, why can't it work for GM? This rendering shows a Chevrolet Nomad version of the new Camaro. Authored by Bo Zolland of Vizualtech in Sweden, this rendering shows what a Nomad version of the Camaro might look like. We learned over the weekend that the Dodge Challenger received the green light to head into production as a 2008 model, and now we have a little more information from the Chrysler Group concerning exactly how many they plan on building. While Camaro production is being planned at a 100,000 units per annum, the automaker appears to be taking a more reserved approach with the Challenger, with word that they will only build in the neighbourhood of 30,000 of the sought after hot rod each year. This is according to a recent report by the Globe and Mail of Canada. The plant that currently builds all Dodge Magnum, Charger, and 300C units – located in Brampton, Ontario – is also being charged with building the Challenger, which happens to be based on the same platform as the aforementioned three vehicles. This low volume approach is in sharp contrast to the strategy that Ford has taken with its Mustang: they made 192,000 of the pony car in 2005. PONTIAC, Mich. – The piston assembly for the 2006 Corvette Z06 LS7 7.0-liter V-8 engine is one of the latest examples of race designs carrying over to production GM engines. Almost every aspect of the short skirt, high strength pistons and titanium connecting rods used in the 505 horsepower power plant is developed through race design know-how. The full-floating piston is made of eutectic aluminum alloy and is CNC machined for balance and tolerance consistency. For durability the top land is anodized. Between the first and second ring lands is a pressure balance groove, another racing carry-over, to control blow-by and oil consumption at high speed. Piston tops are flat with symmetrical valve reliefs providing opportunities for a stroker crank or higher lift. A polymer coating on the skirts to reduce scuffing creates an almost negative interference fit in the bore. The ring pack uses thin rings for high speed sealing control. A 1.2 mm top compression ring is used with a plasma moly face for superior sealing and durability. The second compression ring is also 1.2 mm thick and is made of ductile or high strength iron. The three-piece oil control ring is 2.0 mm thick and is made of nitrided steel for superior wear control and spring force longevity. Nitriding also enables lower ring tension resulting in more power due to reduced friction. Little was spared when it came to developing the connecting rods. The rod is made of a titanium aerospace alloy and uses twelve-point doweled cap screws. The rods are heat treated and have a chromium nitride coating for surface durability. The coating is applied to the thrust facing areas via plasma vapor deposition (PVD) – a process taking 12 hours to apply. Each rod has three weight pads for precise balance. Blind holes are used, to eliminate stress areas, in conjunction with a heat treated style cap screw with a neck down shank for consistent clamp and controlled stretch. The LS7 rod weighs just 464 grams which is almost 30 percent lighter than the similar forged powder metal rod in the base engine Corvette. Yes, thats right, the age old competition between the two best selling ponycars is set to heat up with both taking roles in the new live action Transformers movie. The movie will stray from the original cartoons format to use a bright yellow Camaro concept car as the vehicle form of Bumblebee, portrayed (as the name would imply) in the original by a Volkswagen Beetle. Conversely, the Chevy-powered Autobots arch nemesis is a Decepticon character by the name of Brawl (originally transforming into a tank) that takes the shape of a Saleen Mustang cop car and reportedly jacks up poor Bumblebee. American car makers are turning back the clock to cash in on baby boomers’ nostalgia for the “muscle” cars of their youth. Chrysler is to resume production of its celebrated Dodge Challenger after more than three decades and has updated its Dodge Charger to meet the demand in a flourishing mar-ket for new and vintage muscle cars. General Motors is expected to bring back its Chevrolet Camaro, which is inspired by the 1969 version of the legendary car, and Ford has already redesigned its iconic Mustang. Muscle cars, typically two-door models with high-powered, eight-cylinder engines, bring back memories of cheap petrol, drivein theatres and cruising main street in the Sixties and Seventies. Although times have changed and, with petrol now selling at nearly $3 a gallon, many drivers are looking for less thirsty, compact cars, makers believe there is also a big market for the monster cars. Fuelled by films such as The Fast and the Furious and the return of the 1969 Dodge Charger “General Lee” in the film remake of the television series The Dukes of Hazzard, wealthy baby boomers are now recapturing the days of their youth, when high-school car parks were packed with Camaros, Mustangs and Barracudas. There is even a new television show, Fast Inc. in which experienced car hunters fill in requests for vintage and muscle cars for celebrities, models and eccentric millionaires who are looking to stay ahead of the curve. Very few original muscle cars have survived intact because most suffered modifications at the hands of exuberant young owners. The small number that are still on the road sell for huge sums. A 1970 Plymouth Barracuda was sold at auction in January for £1.6m and a 1970 Chevelle fetched £800,000. Production will begin in 2008. Mr LaSorda did not announce the price or say how many of the cars will be built. The Camaro and the Ford Mustang are expected to cost between £15,000 and £20,000. With the Dodge Challenger getting the green light for production, it's likely only a matter of time before the Chevy Camaro is also approved for production. Rumor has it GM engineers are in Australia hard at work with their brothers from Holden on the next Camaro.. That said, a convertible version should also be in the works. suggests what a Camaro droptop will look like when it hits the streets sometime around 2009. Chrysler is crashing the muscle-car party with plans to build a production version of the Dodge Challenger coupe that debuted as a retro-styled concept car in January at the Detroit auto show. The automaker plans to herald the return of the Challenger at the Pepsi 400 in Daytona, Fla., on Saturday, according to people familiar with the plans.